The Knothole Freedom Fighters. From top, clockwise, Sally Acorn, Bunnie Rabbot, Rotor, Sonic the Hedgehog, Tails and Antoine. Freedom Fighters are resistance groups featured in the Western Sonic the Hedgehog canons that foil many schemes created by Doctor Robotnik and, later, any antagonist that appears on Mobius. The main group of Freedom Fighters are the Knothole Freedom Fighters. 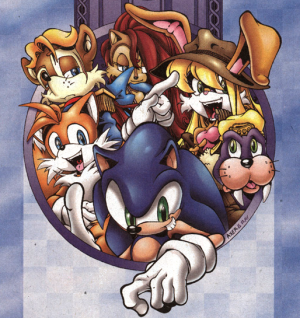 In the second American Sonic cartoon, the Knothole Freedom Fighters consisted of Sonic the Hedgehog - who was the main hero with super-speed; Tails, a two tailed fox who was in admiration of Sonic and wanted to be a full Freedom Fighter; Sally Acorn - who was leading the Freedom Fighters and was princess of the city Robotnik took over; Bunnie Rabbot, a friend to Princess Sally and southern belle who could be used as a means of stretching or power; Rotor Walrus, who would act as the mechanic and smart guy of the cartoon; and Antoine D'Coolette the comic relief, who would try and fail to win the heart of Princess Sally. These Freedom Fighters aspired to revive the kingdom once led by princess Sally's father King Max the way it was before the tyrannical Robotnik came and took over King Max's position; and while these were the focused on Freedom Fighters at the time there were other groups such as the wolf pack who also wanted to get Robotnik out of power. Archie Comics also adapted the Freedom Fighters when adapting the plot points from the TV series into the comic of the same name.. They had the same agenda in the comic as they did in the TV series, but after Robotnik's "death", the king returned and the kingdom has been reestablished in Knothole. The status quo then changed from a group of ragtag rebels to soldiers fighting a terrorist owning a small portion of the globe. However before the term Freedom Fighters began to leave as a term for the comic's fighters and protagonists they had over time included more characters such as Mina Mongoose who is now a former freedom fighter but had been one nonetheless. The Freedom Fighters trained and did not go to regular school in the American comics, because they never knew when a mission would be assigned so they had school when they could fit the time. It is dangerous to be a Freedom Fighter. Sonic and Sally would always tell one another in the TV series to take care because once a Freedom Fighter went on a mission, there was no guarantee they'd be coming back. Sonic and co. remained condemned to live the lives of fugitives even in the UK's fortnightly comic publication, Sonic the Comic. When Sonic and several of his friends were cast six months into the future by Doctor Robotnik, the evil genius used their absence from the time stream to conquer Mobius utterly. Upon his return, Sonic quickly established an underground cell of Freedom Fighters. At first comprised of only himself, Tails, Johnny Lightfoot and Porker Lewis, the Freedom Fighters operated out of a subterranean base that was overseen by the Kintobor Computer, a digitized replica of the mind of Ovi Kintobor, Doctor Robotnik's former self. Other members were occasionally added to the team's roster, but they eventually lost their base and were forced to roam the planet disguised as a traveling circus when Robotnik learned its location and destroyed it. In some episodes of Adventures of Sonic the Hedgehog Sonic refers to himself and Tails as Freedom Fighters. Sally Acorn and the rest of the Freedom Fighters are never seen. However, Sonic Christmas Blast, which is considered an episode of Adventures of Sonic the Hedgehog, has a cameo by Sally Acorn. As shown through the different Sonic the Hedgehog series, there are a number of Freedom Fighter sects operating around Mobius. This page was last edited on 1 February 2014, at 20:09.